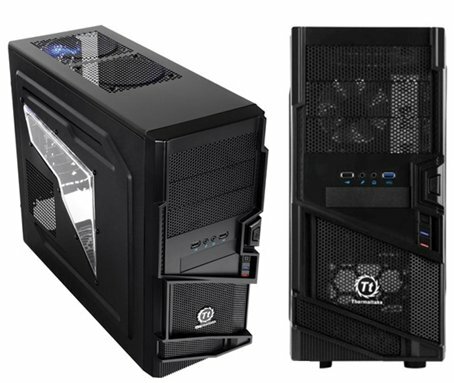 ThermalTake reveals the Commander MS-I, a new budget case for gamers. Thermaltake, a leading brand in DIY computer chassis, is introducing their entry level mid-tower chassis. This new product comes with added features such as extra-long VGA support and cable-management. Users can wire their computer cables underneath the mainboard for enhanced ventilation; this chassis also holds premium VGA card, such as nVidia GTX590 and AMD Radeon HD6990, with ease. Two USB 2.0 connectors as well as HD audio microphone and earphone jacks are on the front bezel, integrating all major multimedia connectors within your hand’s reach. As an alternative and upgraded option, Thermaltake offers a USB 3.0 Super-speed version for transfer-speed seekers. 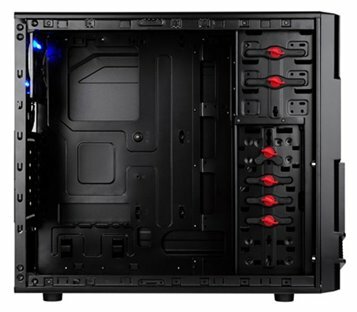 This tool-free, all black Thermaltake Commander MS-I chassis offers a total of 9 drive bays for maximum storage expansion and 7 PCI expansion slots. Inheriting the characteristics of the long line of Thermaltake chassis, special attention was paid to optimizing ventilation and airflow. Therefore, one 12 cm exhaust blue LED fan is installed in the back to warrant immediate heat dissipation. Additional airflow is driven by two ventilation holes on the right side panel and the top of the case. The foot-stand of the Commander MS-I elevates the computer, to allow for improved ventilation at the base, where the ATX PSII power supply is located. To prevent dust from finding its way into your power supply, a removable and cleanable dust filter is positioned underneath, providing users with an easy way to keep your treasured platform spick-and-span. The cases are available in Europe for around 42EUR.